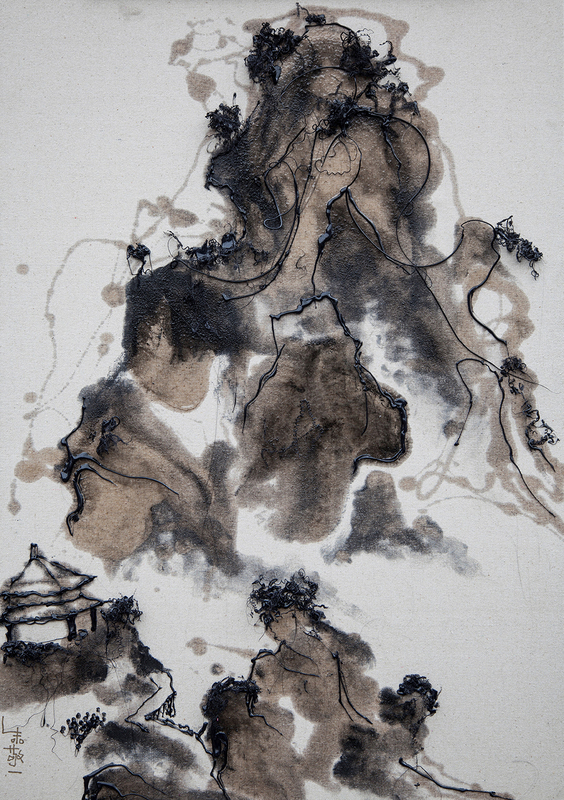 ‘Black Mountain’, an ensemble of selected works by Zhu Jingyi, offers a personal vignette of this innovative Chinese ink artist by chronicling his artistic evolution. In his first solo exhibition at Karin Weber Gallery, the artist shares his life experiences and reveals defining moments during his creative journey that pushed him to infuse a traditional medium with a contemporary influence to challenge the very DNA of the ink painting genre. Zhu became fascinated with traditional Chinese ink painting, its grand and mature view on the world, while studying Chinese painting at university and asked to copy paintings from the Song Dynasty. Yet as he worked on Chinese inks, he always felt that the ink was not dark enough. 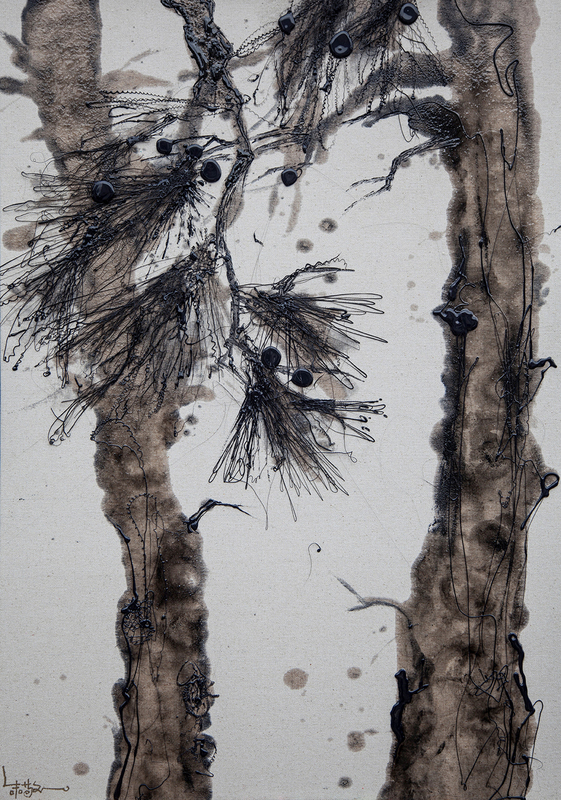 Says the artist, “I wanted to find the darkest black, so I experimented with a lot of mediums on paper such as oil, acrylic and emulsion paint. Whilst using oil, I discovered the potential three-dimensional effect and then I stumbled upon resin, which could be melted and took shape instantly. I applied some basic concepts of architecture to turn ink from two dimensional to three dimensional.” This was a turning point for Zhu – his signature ‘Standing Inks’ were born. 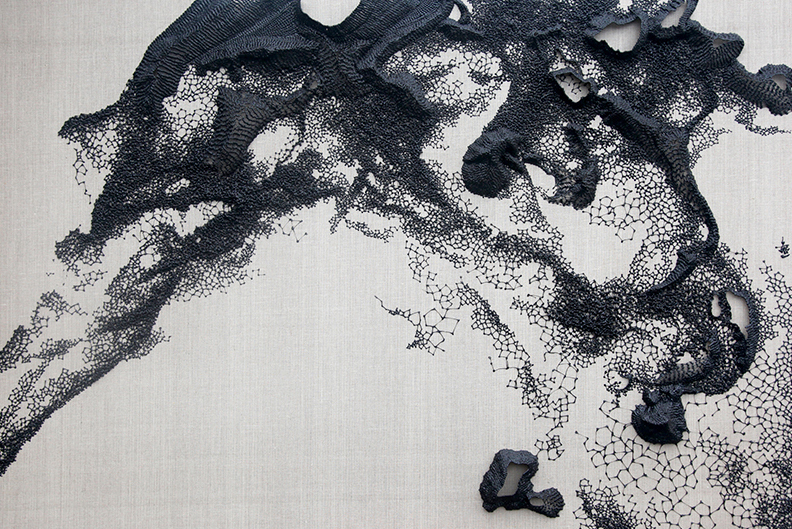 Zhu’s earlier works were mostly landscapes with low relief, delicate, wiry web-like forms reflecting trees, mountains and rocks. As he matured, he created more imaginative, complex works like Overflowing 8 and Meeting of Wind and Clouds, with the ephemeral taking on denser forms as creative impulses flowed from an unconscious or sub-conscious state. Zhu demonstrates his mastery and expert control over the material by creating standing sculptures like Whirlpool. His latest works reflect a lighter, more playful mood as he tries to interpret and make sense of the apparent chaos in nature. 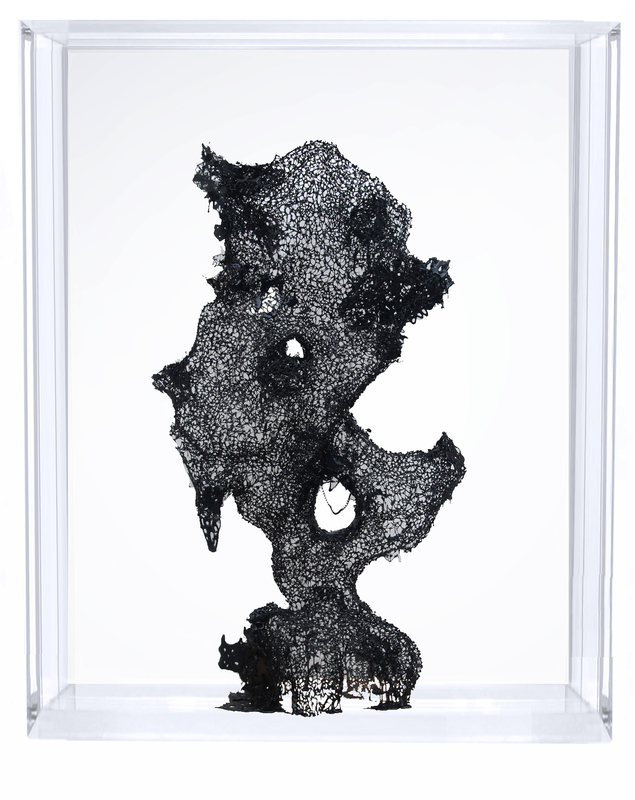 In all his works, the balance between the accidental and artificial shaping of the resin is struck by ingenious application and the inherent malleability of the substance. The result is a pleasing combination of man-made and natural subtle textures. 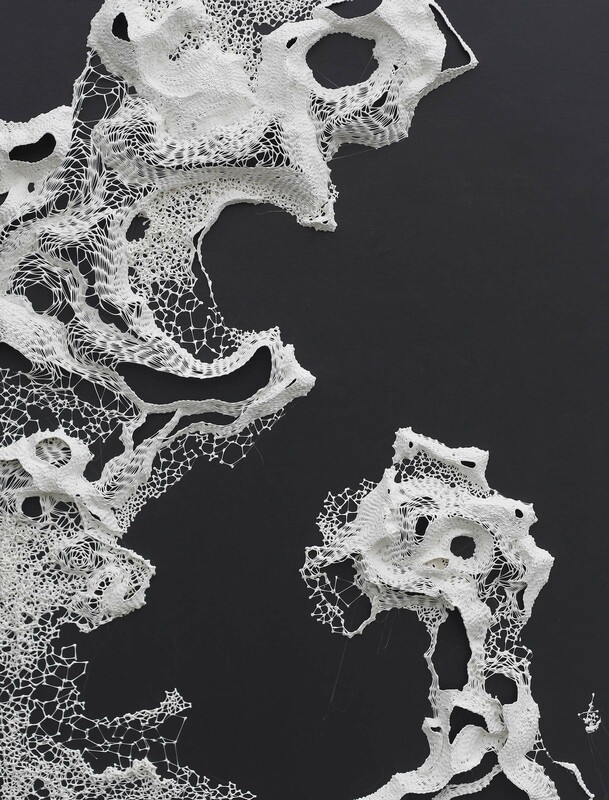 As Zhu’s method of working adapts into an array of forms – standalone sculptures, low relief images and abstract woven shapes, the constant in all his creative outpourings is his search for a self identity that seeks expression – one leg deeply embedded in traditions of the past and the other firmly in the future as an innovator and visionary. Born in 1975, Zhu Jingyi graduated from the Department of Chinese Arts in at Nanjing Normal University, China, He currently lives and focuses exclusively on his art in Shanghai. He has shown extensively in China, with a particular highlight his 2014 site-specific installation ‘All Things’ at Shanghai Pudong International Airport. Zhu’s works have regularly been shown at prestigious art fairs including Art Central and Ink Asia, Hong Kong, where they received wide acclaim. His works form part of reputed private and public collections such as the Today Art Museum, Beijing and the Shanghai Himalayas Museum.